Right Meditation (right mindfulness) I use the disciplines of meditation (dhyana) and focused awareness to contemplate the nature of reality more deeply. Meditation is a core practice of Buddhism. It is a conscious effort to change how the mind works. The Pali word for meditation is 'bhavana' which means 'to make grow' or 'to develop'. It can be used to overcome stress and anxiety, and to deepen one’s spiritual experience. Siddharta Gautama became the Buddha through his practice of meditation. The Buddha taught many different types of meditation, each designed to overcome a particular problem or to develop a particular psychological state.Taking after the Buddha, they favored the technique of the seated meditation, just as Siddhartha Gautama had. “Right meditation” is practiced not only in monasteries, but also in meditation centers that attract Buddhists and non-Buddhists alike. In the movie The Hangover Part II, actors Zach Galifianakis, Bradley Cooper, and Ed Helms as Alan, Phil and Stu walk into a Buddhist temple somewhere in Thailand to return a brother Han, the monk. 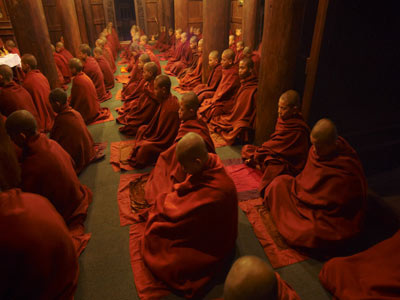 It shows a group of monks meditating before being interrupted by the three males. The three are sent to the garden of meditation, and starts meditating. 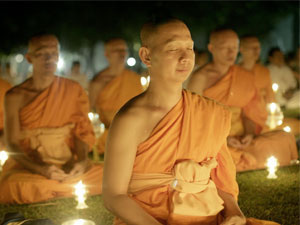 Alan is the only one who focuses on meditating, taking it seriously, and finally finds the answer of where to look for Teddy, Stu's future brother-in-law. Molloy, Michael. "Buddhism." Experiencing the World's Religions: Tradition, Challenge, and Change. 5th ed. New York: McGraw-Hill Higher Education, 2010. 125-183. Print.